IBEW supports many causes in our community and this page is dedicated to featuring some of these. Multiple Sclerosis (MS) is an unpredictable and often disabling disease of the central nervous system. It is the most common neurological disease of young adults in Canada. MS attacks the protective myelin covering of the brain and the spinal cord, resulting in vision problems, numbness, loss of balance, extreme fatigue, tremors and even paralysis. The IBEW in Canada became the first labour union to support a charitable organization on a National level and MS was that charity. October 17th is the day internationally recognized as the day to fight poverty and as hunger is one of the most basic needs that are consistent in the impoverished. 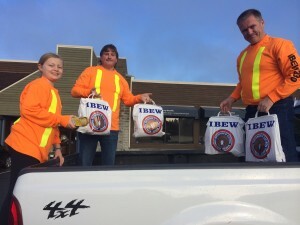 A couple dozen members and family members went grocery shopping at a local grocery store chain that only uses IBEW to wire their stores then dropped off the non-perishable foods to local food banks. I would like to thank those members that gave up their Saturday morning to help out those weakest in our communities.